No criminal charges will be brought in connection with the Big Brother racism row, Hertfordshire Police has said. The Crown Prosecution Service has decided that what occurred was "clearly offensive" but "not criminal". The inquiry centred on a series of clashes between Shilpa Shetty and three other housemates - Jade Goody, Jo O'Meara and Danielle Lloyd. The row sparked a diplomatic incident following the treatment of Shetty, who went on to win the Channel 4 show. The police force said programme-makers Endemol and Channel 4 had "declined to co-operate" with their requests for unedited footage from the programme. But the constabulary decided it was not in the public interest to make arrests or pursue footage through the courts. A Channel 4 spokesman said: "In response to Herfordshire Police's statement issued today, Channel 4 was in an ongoing dialogue with the police and provided them with access to many hours of broadcast programmes. "A substantial amount of further footage was requested and our policy, consistent with that of all broadcasters, is to require the police to obtain a court order before such material is handed over," he added. The police said they wanted to speak to six of the former housemates but Goody and her mother, Jackiey Budden, who also appeared in the show, declined. 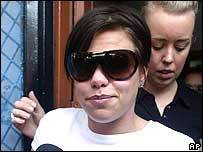 One of those who was interviewed was model Danielle Lloyd, who asked to meet the police herself. "During the interviews, everybody stated that they had not witnessed or perceived they were a victim of any racist behaviour," the police statement said. Shetty's spokesman Max Clifford said: "This is exactly what we expected. It won't take anybody by surprise. But millions of people saw and heard for themselves so I suppose that's the nearest we'll get to justice." Tens of thousands of viewers complained about the way Lloyd, TV star Goody and singer O'Meara treated Shetty in the reality show's celebrity version. Goody was seen calling the Bollywood star "Shilpa Poppadom" while former model Danielle Lloyd declared the actress should "go home". O'Meara imitated Shetty's accent and said Indians were thin because they undercooked chicken. All three contestants have since denied racism and have apologised for their actions. Their behaviour caused a media furore and led to politicians entering the row. Chancellor Gordon Brown said the issue had been raised repeatedly during a trip he took to India while the series was running, adding that Britain should be "seen as a country of fairness and tolerance". Shetty was shown around the House of Commons by Labour MP Keith Vaz, where she had a brief meeting with Tony Blair. Carphone Warehouse recently announced it would be dropping its £3m sponsorship of Big Brother in the wake of the row.